A few weeks back I announced the retirement of Lync 2013 exams. See the post here. I want to let you know that we are moving the retirement date of Lync exams (335, 336, 337, and 338) to November 30, 2015. We’re updating the retirement dates on our web pages to reflect this. Remember, the new Skype for Business exams will count toward MCSE: Communication certification like Lync exams 336 and 337 currently do. Stay tuned for more information on the new Skype for Business exams! Q: Should I hold off on taking exams until the Skype for Business exams are available? A: Not at all. Skype for Business builds on Lync’s features and functionality. The Lync exams provide you with a solid foundation for your Skype for Business implementation. See what’s new in Skype for Business. Q: Will there be an upgrade exam for those who have completed both Lync exams and want to move to Skype for Business? A: No. Once you’ve earned your MCSE: Communication certification you cannot re-earn it. You can, however, keep it current through recertification. If you’re not ready to recertify but want to gain some Skype for Business skills, check out this training video. A: Holders of the MCSE: Communication credential must recertify every three years. Recertification is a great way to ensure that you stay current in the latest technology, such as Skype for Business. We’ll be providing more information about recertification options for MCSE: Communication this summer. Q: I’m a partner with the Microsoft Partner Network. I have the Communications Competency and just took the Lync exams to qualify. Do I still qualify? A: Retirement of an exam from Microsoft learning does not retire it as a qualifying exam for a Competency. Lync Exams for the Communications Competency will still qualify for a period of time. Always check the Microsoft Partner Network competency requirements. You can view the current Communications Competency requirements here. Microsoft a publié hier l'outil SEFAUtil pour Skype for Business 2015. Skype for Business Server 2015, SEFAUtil (Secondary Extension Feature Activation Utility) is a command-line tool that enables Skype for Business Server 2015 administrators and helpdesk agents to configure delegate-ringing, call-forwarding, simultaneous ringing, team-call settings, and group call pickup on behalf of a Skype for Business user. This tool also allows administrators to query the call-routing settings that are published for a particular user. This evolution combines the ease and familiarity of Skype with the communication and collaboration features of Lync and enables you to conduct your business through an enterprise-grade secure platform using the devices you already have. What's new in Skype for Business for Windows Phone? Skype for Business for Windows Phone includes a new look and feel, new emoticons, and other improvements. And, if your organization uses Skype for Business Server 2015, the ability to communicate with your Skype contacts using IM, audio call, and video call. We've spelled out all the details in Lync for Windows Phone is now Skype for Business—see what's new. See that article for the full story. Does Skype for Business run on all versions of Windows Phone? Skype for Business runs on Windows Phone 8.1 and later. If you're using Lync on an earlier version of Windows Phone, continue to use it and we won't send you the update. You'll receive the update to Skype for Business if your Windows Phone is version 8.1 or later. The update will be automatic unless you've disabled automatic updates in your Settings menu. Once updated, your Skype for Business contacts and meetings will still be there and will work just like they did in Lync. 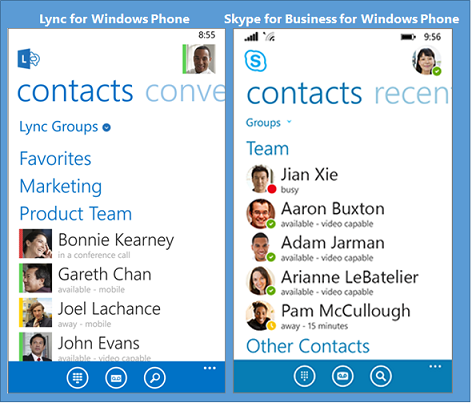 If you're using an earlier version of Windows Phone, you'll continue to use Lync 2013. You will not receive the update to Skype for Business. I've never used Lync or Skype for Business on my Windows Phone. Where do I get it? To use Skype for Business for Windows Phone you need a Skype for Business or Lync account—typically the same user name and password you use when signing in at work or school. If you're already using the desktop version of Skype for Business, then you have a Skype for Business account. You can download the app from the Windows Phone store. See Download, install, and sign in to Skype for Business for Windows Phone 8.1 for more information. I don't have a Windows Phone. Is Skype for Business available for Android or iOS? Not yet, but check back often. Skype for Business for Android and iOS is coming soon. In the meantime, if you have Skype for Business on your desktop, you can continue to use the Lync 2013 app on your iOS or Android phone until the new Skype for Business app is available. Voici la première cumulative update pour Skype for Business! The cumulative update resolves an issue in which a call is disconnected when a user un-parks the call. The cumulative update resolves an issue in which Skype for Business Web App crashes. Microsoft vient de publier une mise à jour de l'indispensable Network Planning, Monitoring, and Troubleshooting with Lync Server guide. Updated June 2015 to replace Call Quality Methodology and Key Health Indicators information with links to the new published content. Lync Server is a real-time unified communications application that relies on an optimized network infrastructure to deliver high-quality media sessions. This guide provides a model for managing the network infrastructure for Lync Server 2010 and Lync Server 2013. Can't verify the certificate from the server. Please contact your support team. 2014-04-23 15:18:31.230 Lync[247:3b2ae18c] INFO APPLICATION CTransportRequestRetrialQueue.cpp/822:Req. completed, Stopping timer. 2014-04-23 15:18:31.351 Lync[247:3b2ae18c] INFO UI CMUIUtil.mm/1722:Mapped error message is 'We can’t verify the certificate from the server. Please contact your support team. To resolve this issue, install your Enterprise Root CA Certificate on the iOS Device. You can do this manually or by using the Apple Configurator. his article describes how to remove the LastActive attribute from the aggregation state category in Microsoft Lync Server 2010, Lync Server 2013, Skype for Business Server 2015, and Skype for Business Online. Note The Lync Server presence schema includes a method for calculating and displaying how long a user is away or offline. This is known as "Last Active." The LastActive attribute returns presence inquiries only from users who have the "Colleagues," "Workgroup," and "Friends and Family" privacy relationships. For more information about presence information in Lync Server, see the "References" section. Last Active presence information may be incorrectly interpreted as reflecting the actual user's status at work. Therefore, users may rely on it to remotely monitor an employee's activity. However, this behavior is not enabled in some countries. Last Active presence information that's provided to users should not disclose how long a user is away or offline for business reasons. Note The aggregate presence data that's calculated by Lync Server contains the status history of each user's endpoints if a user is signed to multiple endpoints. The status of each endpoint changes automatically in response to system events (such as logon, logoff, workstation lock and unlock, and network connectivity events), configured timeouts, scheduled meetings, and user activity. The status of each endpoint can also be changed manually by the user. In this situation, Last Active presence information should not be considered an accurate measure of the user's presence. Last Active presence information is intended only to provide additional information about the user’s availability and willingness to communicate. Copy this file to the path that's specified in step 2 on every front-end computer in the pool in which you want to remove the LastActive attribute. Restart the Front-End Server service (RtcSrv or RtcHost) to apply these changes. Note This resolution affects only new data that's published after the update is applied. It does not fix old data. Users must change their presence manually or by signing in for the LastActive attribute to be removed. Configure your computer for Skype for Business Online management. To do this, see Using Windows PowerShell to manage Skype for Business Online. Start a Skype for Business Online Windows PowerShell session. Note you may see a warning about unified contact store. You can safely ignore this warning. The LastActive attribute will be disabled after some hours. Users must restart (change presence manually or sign out and then sign back in again) before the LastActive attribute is removed from their presence. After the publisher has republished, subscribers must sign out and then sign back in again before the LastActive attribute no longer appears. There is also a known issue in Skype for Business Online (see the "Known issues" section) in which outdated or inaccurate LastActive information is occasionally displayed. Ayant eu quelques questions sur le sujet récemment, qu'en est-il de cette fonctionnalité si attendu (Shared Line Apparence)? Basé sur du MSPL, cette application devrait être disponible pour cet automne. Actuellement supporté seulement par certains modèles de la série VVX de Polycom. On trouve quelques éléments de réponses dans la présentation durant le dernier Ignite de Jamie. The Decrease List Level and Increase List Level functions are unavailable in PowerPoint Web App in the Chrome web browser. The name’s a bit of a mouthful, but “Convert-SonusSbcConfigToWord.ps1” takes the backup file from your Sonus SBC/UX 1000 or 2000 gateway and creates a new Word document, with all of the important(?) configuration information captured in tables. The script automatically pulls the QoEMetrics instance name from the topology and query the database for all reported calls within the last week. The purpose of this tool is to give you an easy front end GUI to review your user's call forwarding settings. Information such as who's a delegate of who, who's got simultaneous ring set, who's forwarding where, etc. can be difficult to retrieve without a utility such as sefautil, which itself can be difficult. This tool allows you to review this information for all users in a pool in a GUI format that's easily searchable, sortable, and filterable (Out-Gridview). It also allows you to save the information to a CSV file. The information is gaterhed by parsing data pulled using Export-CSUserData. No SQL calls are made and no data is written back into Lync. Because this tool uses Export-CSUserData, please be patient during the loading process. If you have difficulty using this utility, first ensure you can run Export-CSUserData successfully. If there is any corrupted user information in a pool, this can cause issues and that corruption will need to be resolved first. If you would like to see the information in a different format, say an PowerShell command such as Get-CSUserForwardingInfo that can run for a single user or pool for speed, let me know as well. If there's interest I can write it. Though it runs fine on Skype for Business, a separate Skype for Business utility will be released as well with additional information related to Call Via Work. Finally, the question that I imagine will be asked is: If you can pull this data as read-only, why not give the ability to modify and write it back and avoid sefautil all together? The quick answer is, I have another utility for this that I have not yet released, and reading the data is much simpler than writing it. I am still putting it through it's paces for quality and will decide if it should be released later. Microsoft vient d'annoncer aujourd'hui plus d'informations concernant le surface hub. Microsoft announced this morning that its Windows 10-based Surface Hub will be available for order starting on July 1, with the devices shipping to customers in September. As you might expect, Surface Hub comes with a heady price tag: about $20,000 for the 84-inch 4K version, and $7000 for the 55-inch 1080p unit. But Microsoft can accurately claim this is aggressive pricing for the market Surface Hub targets. L'infrastructure serveur Skype for Business est disponible au téléchargement depuis le 1er mai 2015. Nous sommes heureux d'avoir la chance d'acceuillir pour cette session le MVP Lync/Skype for Business Jeff Schertz de Polycom. Les sessions seront animées par les deux Microsoft MVP Lync/Skype for Business pour le Québec, Jean-Philippe Breton, Président de Akilon, et Christophe Boucetta, Directeur technique UC de Solulan. La session est gratuite et accompagnée de boisson, nourriture offerte par le groupe des usages UC de Montréal. Microsoft vient de publier une mise à jour pour Lync 2013/Skype for business. Microsoft vient de publier le Skype for Business Server 2015 Management Pack. End-to-End scenario availability from various locations. Call reliability and quality perceived by real users. Geographically distributable end-to-end scenario validation for Skype for Business Server 2015 deployments. This includes coverage for internal, remote and branch office users. Increased scenario coverage in areas like AV Edge Connectivity and Exchange Unified Message Connectivity. Enhanced troubleshooting logs to streamline root cause analysis of failures. Increased reliability monitoring of real end user calls and conferences. Integrated media quality alerts driven from Quality of Experience (QoE) data reported by client applications. Full event and performance monitoring for all Skype for Business Server 2015 roles. Microsoft vient de publier le Video Interop Server Synthetic Transaction Support Package. This download includes support files needed to run Skype for Business Server 2015, VIS Synthetic Transactions. The package contains configuration files and media to support Video Interop Server Synthetic Transactions. These are needed in addition to the Synthetic Transactions that get installed through OCSCore.msi. Toronto, June 2, 2015 – Microsoft today announced plans to deliver commercial cloud services from Canada. Azure, Office 365 and Dynamics CRM Online will be delivered from Toronto and Quebec City in 2016, further strengthening Microsoft’s footprint in Canada’s competitive cloud landscape. “Soon, the Microsoft Cloud will be truly Canadian,” said Kevin Turner, Worldwide Chief Operating Officer, Microsoft, who travelled to Toronto to make the announcement. “This substantial investment in a Canadian cloud demonstrates how committed we are to bringing even more opportunity to Canadian businesses and government organizations, helping them fully realize the cost savings and flexibility of the cloud,” said Turner. According to IDC, total public cloud spend in Canada is projected to grow to $2.5B by next year. The fastest growth will be from Public cloud infrastructure with a strong 45 per cent increase by 2016. These new locally deployed services will address data residency considerations for Microsoft customers and partners of all shapes and sizes who are embracing cloud computing to transform their businesses, better manage variable workloads and deliver new digital services and experiences to customers and employees. General availability of Azure is anticipated in early 2016, followed by Office 365 and Dynamics CRM Online later in 2016. Canadian customers of all sizes are already in the Microsoft Cloud. Even today, Microsoft delivers cloud-based email, Office 365, and CRM Online to more than 80,000 Canadian businesses. Companies like Air Canada, Quebecor and Hatch are saving money while empowering their employees to collaborate, be more productive and mobile with Office 365, Yammer, and Skype for Business. “Information systems and technology continue to be a differentiator for Hatch as it helps us to gain advantages in the marketplace – our use of Microsoft cloud is an integral part of this success. We are now able to focus on our business while benefiting from all the innovation Microsoft offers with a Service Level Agreement we can count on.” Christopher Taylor, Global Director, Hatch. Ontario’s Deputy Premier and President of Treasury Board, Deb Matthews, applauded Microsoft’s commitment to enabling Ontario businesses to compete globally. John Tory, Mayor of Toronto, praised the announcement as a significant boost to Toronto’s digital infrastructure. Tory noted that it’s estimated that more than 14,000 jobs in Toronto are connected to cloud computing. “We decided to move to the cloud with the Office 365 suite because of the globalization of CDPQ’s investment activities and our need for simplified collaboration among our teams around the world”, said Pierre Miron, CDPQ’s Executive Vice-President, Operations and Information Technologies. “CDPQ also welcomes Microsoft’s decision to establish two data centers in Canada, one in Quebec City and the other in Toronto,” added Miron. ILS supporte la fonctionnalité globale de réplication de plan de numérotation et ne fonctionne que sur le gestionnaire de noeud de publication de communications unifiées. L'exemple ci-dessous montre la configuration entre deux clusters dun partage des informations de l'annuaire URI. Configuration du cluster en 2 en mode hub. Dans cette exemple, j'utilise un mot de passe. Étant le premier hub, laisser le champ vide. Configurer le cluster 1 en mode spoke. Dans la fenetre "ILS Cluster Registration", préciser l'IP du Hub.